Becoming a fabulous coach doesn’t just happen overnight – it takes a lot of hard work, dedication and practice. But would it surprise you to know that you already possess some essential coaching skills? Coaching has risen in popularity over the past few years, but many don’t realize the hard work it takes to become successful and enjoy a lengthy career. One question I get asked over and over is, “can anyone be a coach?” The short answer is both yes, and no. There's a lot to learn, if you're willing to put in the time and effort. And not just so you can call yourself a “coach” - I'm talking to TRULY become an effective and professional coach - one that makes clients happy and has others lining up to work with them. As with everything worth doing in life, you can't expect success to be handed to you with no extra study or training involved. If you're not interested in refining your skills, then coaching probably isn’t a good fit for you right now. But if you're interested in finding out more about what it takes to become the best coach you can, keep reading. Below are a few coaching skills you probably already have, but need to refine a little bit more to get you on the right track! One of the most important traits you need for coaching is compassion. You'll often encounter clients who are emotionally and physically stressed from trying to make their business ideas work, and they need some support and guidance from you – their coach. It doesn’t really matter how big or small the dilemma is, your job is to make sure they feel like you're there to give them guidance and reassurance in times of need. Consider your own experience and if you've been in their position before, you'll be better equipped to give your client the right tools to deal with the problems at hand. Another skill all coaches must have is the ability to be innovative. Coaches are always coming up with problem-solving techniques and looking for new and fun ideas to highlight their skills to clients. Rather than doing what everyone else is doing, it pays to think outside the box, especially in a field like coaching. The best way to refine this skill is to do research and stay on top of new coaching techniques. 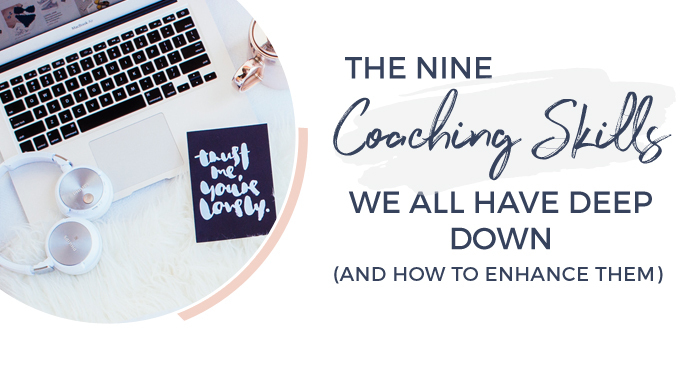 Whether it’s by reading your favourite weekly blog post, or watching a new TED talk, it's a good idea to constantly work on your skills, get inspired by what's already out there, and discover how you can approach coaching in unique ways. It's one thing to talk and another altogether to communicate clearly and concisely with your client. Learn to articulate your thoughts in a way that others can understand. Fantastic coaches are able to communicate their message, voice concerns, and give valuable feedback to their clients in an understandable and relatable way. What’s the point in giving information that doesn’t make sense to your client? Public speaking can help you develop this skill, since you'll learn to articulate your thoughts to a wider audience. If this just isn’t on the cards for you, or you simply don’t have the time, then blogging is also another great way to help refine your ideas and develop your writing style. To be a successful coach, you have to be trustworthy. If your clients trust you wholeheartedly, your working relationship will be stronger, and your client will be able to confidently confide in you. This is a remarkable trait to have (especially if you are the face of your business), because you're treated as a personality that people can trust. The more you work on your private image in your business, the more it will reflect on your public persona. A surprising trait that people often think is underrated is the ability to be able to listen when someone is talking. It's often said that great coaches listen more than they actually talk. Make sure to take a list of your client's main points so you can address each one properly and give it the recognition it deserves. Not only will your client value your listening skills, but it will make them feel more trusting towards you and they'll feel like they can open up more. There is nothing more supportive than offering an ear to your client. This is more valuable than almost any other skill on this list. Again, try and visualize yourself in their position, and at the end of your session offer informative guidance that can help solve their problems and kickstart their dream career. The great thing about being a coach is that you can see something from an outsiders, impartial point of view. You're easily able to assess the situation and give your unbiased opinion to a client. If you want to be a good coach, then positivity is a must! Nobody wants guidance from someone who can't see the positivity in their own personal life. Make sure to express your thoughts with a positive point of view. At the same time, don’t be scared to voice your opinion to your client about certain issues. Articulate your thoughts in a way that's encouraging and helpful. Who wants to work with someone who just doesn’t feel focused or passionate about their line of work? Not me! One of the main reasons I love coaching is that I get to work with driven individuals who've set their goals and want to live their dream life. Not only is it important for the client to be focused on what they want to accomplish, but the coach must be too. Exemplary coaches are always ready to tackle anything that comes their way, no matter what distractions might be going on around them. A great coach is always observant and knows exactly how to read between the lines – especially if a client isn’t exactly being clear. Sometimes people don’t tell you how they feel, they show you. It's your task to determine what these mannerisms mean and how you can translate them to your client. Skilled coaches learn how to pick-up on these non-verbal cues and use them to help their clients.. The only way you, as a coach, can help someone to grow their business is by being honest. Great coaches don’t choose to lie to their clients, even when things aren't always looking the best. At your discretion, it's important to voice your opinions to your client – even though it might not be what they want to hear. Coaches that succeed don’t tell their clients what they want to hear. Just make sure that you are giving them a balanced view of the situation from your perspective. Be kind and show compassion to your client, but don’t fool them into thinking anything that isn't true. Carry yourself with positivity and enthusiasm, and make sure you're coming up with solutions to fix their problems. Even though you might already possess these skills, it’s important to build on them, especially if you're in the coaching industry already or looking to revamp your business. The key to becoming a great coach is to be yourself. Make sure you represent someone who you would’ve turned to when starting out. Someone who is trustworthy, reliable, honest and shows a level of understanding. One who can give you the tools necessary to kickstart your business, and start living the best life possible. If you’re ready to do the work it takes to become a coach, check out Coaching Mastery Certification and our free training Your New Career as a Coach to support you to build a successful career in coaching. Join me for this free mini training.